Hello my friends! I hope you had a great weekend! We have a BUSY week ahead, but we had fun kicking off all our Halloween festivities over the weekend! On Friday, the kids dressed up as their future selves for school. We were in a rush to get out the door (when are we not on school mornings?! ), so I didn’t get a picture- but Ben dressed up as a Clemson football player, Gracie was a chef, and Brantley was a veterinarian. It was very low key dressing up- we had all the costumes/clothes already, and didn’t have to buy anything (Halloween costumes are already getting to cost a fortune, aren’t they?!). Then Friday night was Trunk or Treat at the kids’ school! As stressful as it always is for me to think about and plan, it really is a fun event, and I love seeing all the kids and handing out candy. It was a lot of fun, and we were all exhausted once we were done! We had to move the Trunk or Treat inside the school since we had yucky, rainy, cold weather on Friday night, but it suited me just fine. We decided to have a superhero theme, and I was lucky to find this cute cityscape photo backdrop that was perfect for our trunk/wall! I bought a package of the superhero paper lanterns too, and it worked out great! Good thing is too, that I can save the backdrop and lanterns and either use them for party decor in the next year or so, or just give them to a friend to use, ha! SUPER easy, low maintenance, and it looked really cute. 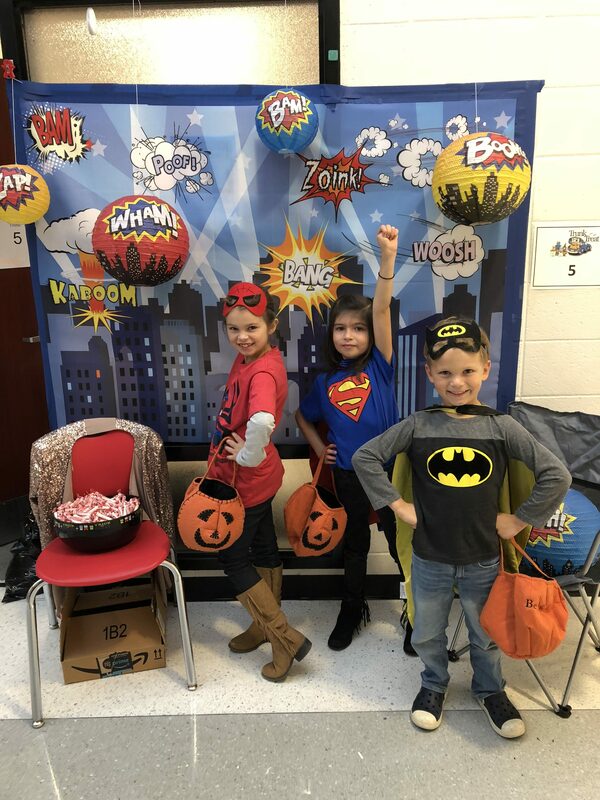 There were even a few little superheroes walking the halls for candy that posed in front of the skyline for pictures! Saturday was a rainy, nasty, cold day, so we stayed inside for the majority of it! We went out for breakfast at a local place (that honestly, was mediocre at best, and was pretty disappointing) and went back home to lounge pretty much all day long. We watched football and I even got a nap in! I planned on catching up on laundry, but, welp, it seemed to not be quite as important as that nap, ha! We bummed around pretty much all day long, and it was great. 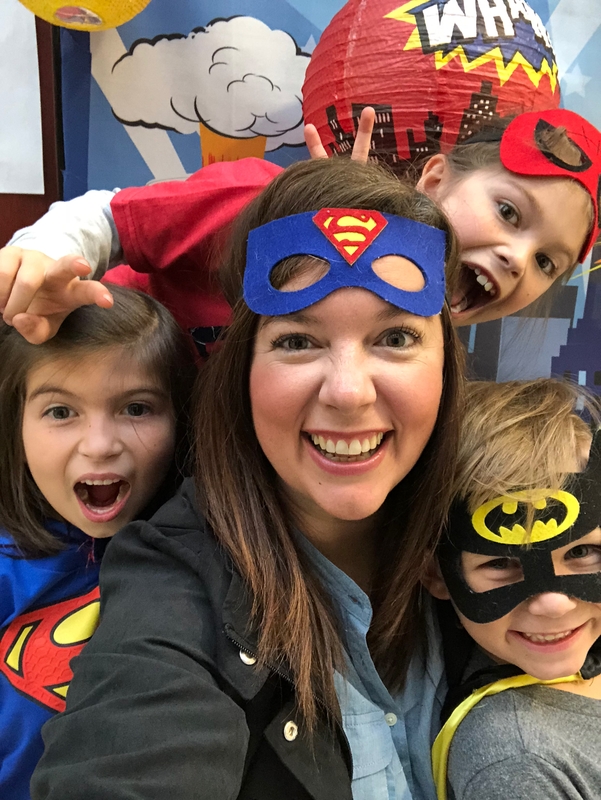 On Sunday, we got up for church, came home, ate some lunch, got in another quick nap, and then headed out to trunk or treat two of three, but this time at our church! Ben and Scott stayed home to make some chili, and I took the girls with me. There was your typical trunk or treating, but also free hot dogs, face painting, a corn maze, bouncy houses, and more. It was a lot fun! 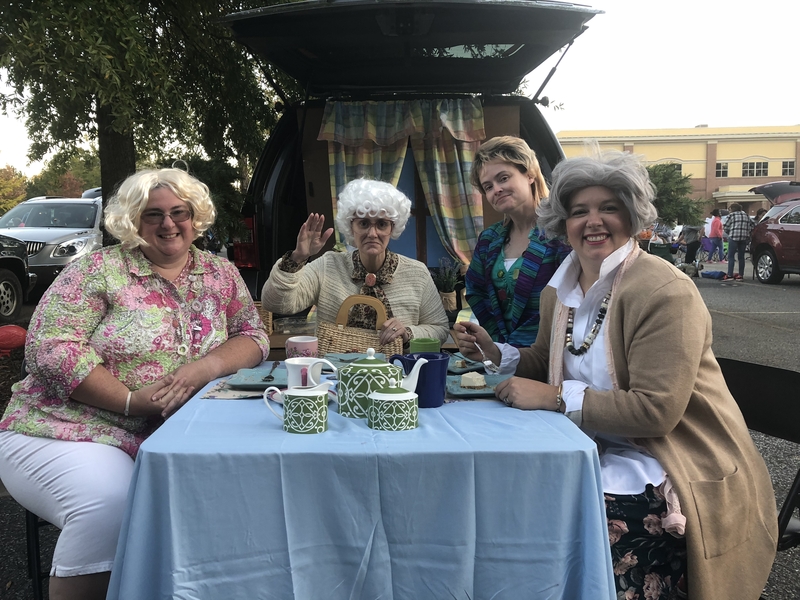 But most fun of all was the trunk my friends and I did- The Golden Girls! We had so much fun as we handed out candy to the kids and all their parents guessed (correctly!!) who we were. The Golden Girls are clearly universally loved and we got the best reactions from kids and parents all evening long! The only thing I had to buy for my costume was my wig! I was Dorothy from the group, and popped the collar on one of Scott’s old shirts, wore it over a maxi dress with a cardigan over the top, big necklace and earrings. It was fun and easy, and we had a great time! And when we got home, we had chili waiting on us! Not a bad way to cap off the weekend! I hope you have a wonderful start to your week and a great Monday!